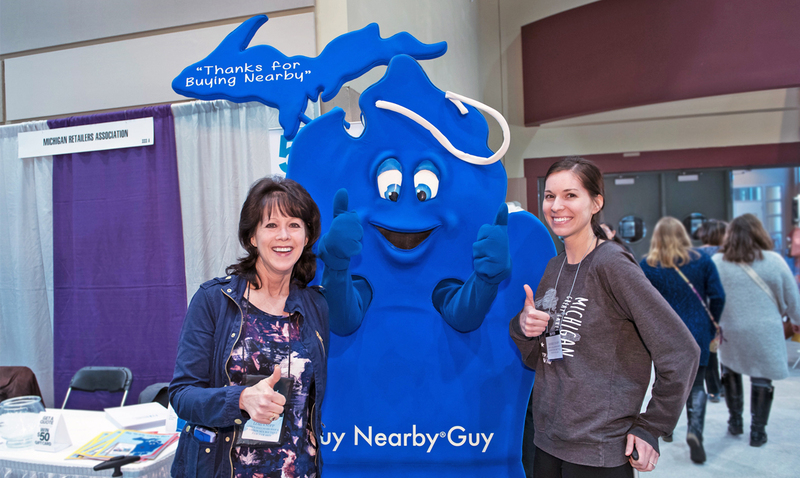 Buy Nearby Guy, fresh from a year-end cleaning and minor repairs at The Parade Company in Detroit, greeted retailers and vendors Sunday during the first day of the Lansing Gift Show. 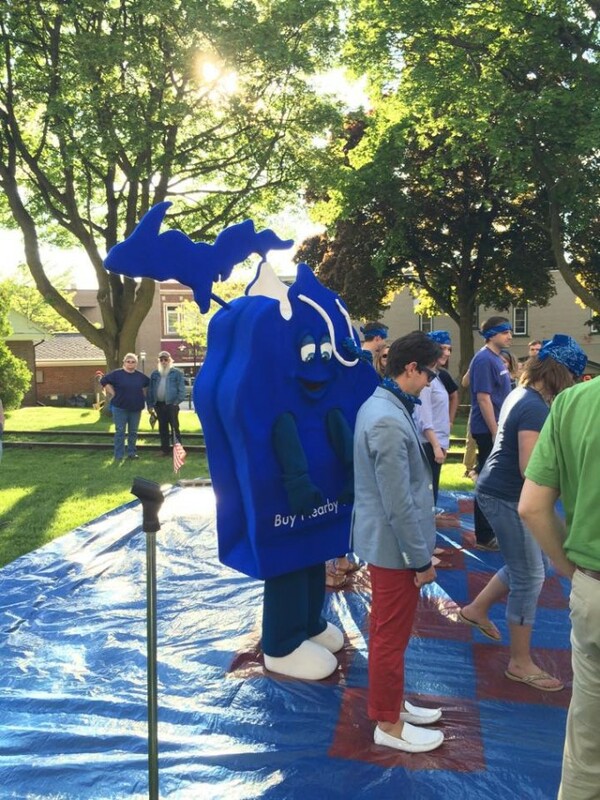 The large, blue shopping bag in the shape of Michigan will make dozens of free visits this year at community and retail-related events. Request a visit by using the form on the BuyNearbyMI.com website. The annual weekend celebration of Buy Nearby will take place throughout Michigan on October 7 & 8, the first full weekend in October. It’s never too early to start thinking about how to make it a special weekend for customers and community visitors. If there’s already a festival or special event scheduled in town that weekend, you can start exploring how to integrate Buy Nearby into the event. If not, what can you and your neighboring businesses create? Buy Nearby thanks DTE Energy for again demonstrating its commitment to the communities it serves and to the state’s economy by remaining the chief sponsor of the campaign. 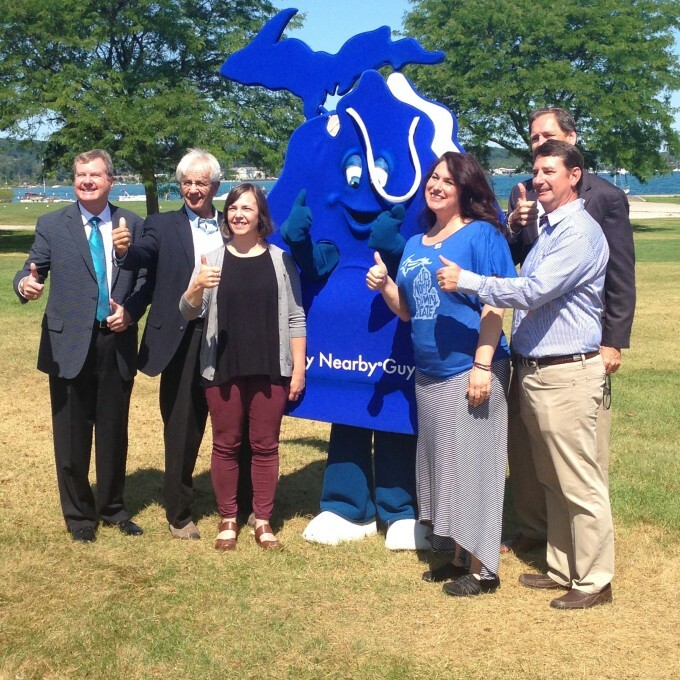 This is the fifth year for Buy Nearby and the fifth time DTE Energy has been the title sponsor. Supporting sponsorships for 2017 are still available at $5,000 for the year. Sponsorships help pay for retail and community promotional materials and the costs of the mascot’s community visits around the state. Also, individuals can contribute any amount by contacting Buy Nearby. Martin Waymire, Buy Nearby’s Lansing-based public relations firm, received the First-Place Pinnacle Award in the 2016 PACE Awards competition held by the Public Relations Society of America’s Central Michigan Chapter. The award recognized the firm’s work on the expanded I Buy Nearby Weekend. The firm also won the PRSA chapter’s 2015 first-place Diamond Award for its work on the overall campaign. With our first event of 2017 in the books, we are looking forward to a busy year! 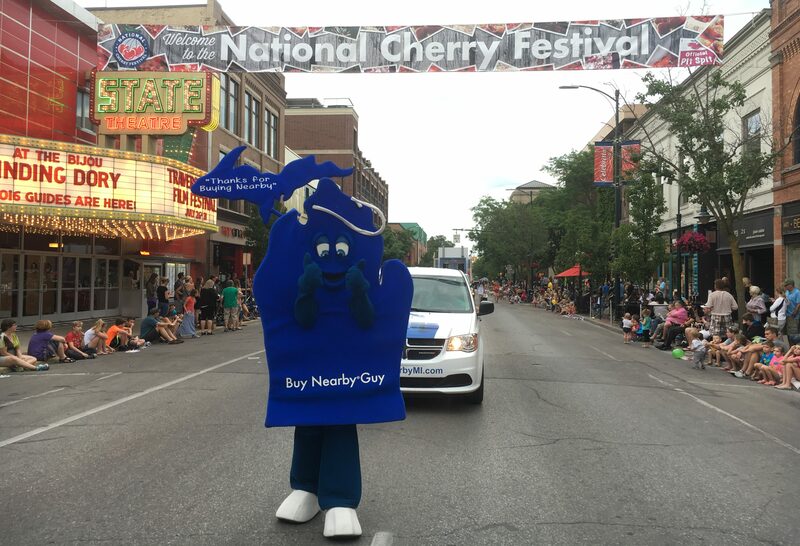 If you are out and see the Buy Nearby team, please swing by for a photo with Buy Nearby Guy and tag us in your photo and use the hashtags #buynearbymi and #ibuynearby. If you want to join our email list for more information on the campaign, send an email to buynearbymi@retailers.com. You can check out all our social media at: Facebook, Twitter, Instagram, Youtube. Responsible and outgoing college students looking for an exciting internship should check out Buy Nearby. For more information on the internship visit our website.